Remember the spy novels of Cold War times? Where pretty much everybody was suspected of being a ‘mole’? 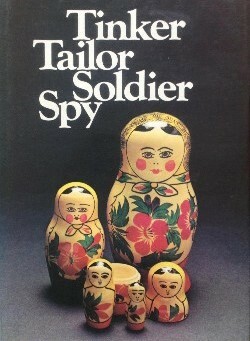 The master storyteller of brilliant double agents was John Le Carré, and one of his very best novels was Tinker, Tailor, Soldier, Spy, published in the spring of 1974, incidentally one month after Willy Brandt had resigned because he had an East German spy among his closest collaborators. The more the Brexit referendum debate unravels, the more it reminds me of Tinker, Tailor, Soldier, Spy, the title of which refers to the code names given to some of the suspects and borrowed from an old nursery rhyme (not that this is of any importance for this post). The parallel between the Cold War spy novels and the Brexit referendum campaign is the haunting question whether there is a double agent, seemingly pursuing a publicly proclaimed preferred outcome, but secretly aiming at provoking the exact opposite. If the Brexit referendum was a TV series like Borgen or Deutschland 83, the best possible cast for the double agent would undoubtedly be David Cameron. He would actually be too good to be true. The most brilliant and efficient ‘moles’ always have the appearance of bland people, underestimated by everybody. They are unspectacular, not really stupid but not particularly bright either, sometimes clumsy, but almost touching in their awkwardness. They have cover stories that have been built over years, so patiently that they have become entirely credible, so convincing, so obvious. If I had to write the scenario of this TV fiction I would therefore lay great emphasis on the perfect fake identity for my double agent. Here is a rather average politician who has been put by circumstance in the position to lead the country. From the beginning it has been ‘evident’ that he was not madly in love with the European Union, but had come to the pragmatic conviction that EU membership was on the whole a better option for Britain than splendid isolation. Unfortunately, to his sincere regret, he has to put up with a bunch of obnoxious backbenchers and an aggressive, populist alliance of Eurosceptics and xenophobes that forces him – against his will! – to commit to holding a referendum about EU membership. There’s no danger, though, the polls predict a stable majority for remaining. Relief! In the meantime he is bravely trying to limit the damage, by cleverly turning things into a win-win situation. He engages in a renegotiation of the terms of membership with his European partners, the positive outcome of which should strengthen his position and enable him not only to keep Britain in Europe but actually be perceived as an energetic reformer. Of course, he goes about it in somewhat clumsy manner, almost jeopardising his chances of success. And he also seems to handle all other details – the wording of the question, the fixing of the date, the issue of party discipline etc. – in his own hesitant, awkward way. Some cliffhangers later the dénouement would be written in the future past, why not narrated in emotional flashbacks. He will have dauntlessly fought and argued in favour of membership, and once it’s all over and the leavers pop their (probably EU-produced) champagne, he remembers the day when he warned all stakeholders that his personal commitment and charisma may not be sufficient to counter-balance the momentum of nationalism spurred by a hateful press. Looking back, the spectators will recognise that there will have been something inevitable about Brexit from the beginning; it’s just they were tricked by the scenario and the main protagonist into not noticing it. And with relations between the UK and Europe being what they are, the end of the story would be somewhat open, leaving the possibility to shoot a second season soon. If this sounds all too silly, it’s probably just that I read too many Cold War spy novels in my Cold War youth. Apologies for letting my imagination run wild. At the same time, you will have to admit: if ever there was a soviet master spy like John le Carré’s mysteriously named ‘Karla’, driven by the long-term objective to dislocate the European Union, he could not possibly have recruited a better double agent than David Cameron, could he? This entry was posted in Current Affairs and tagged Brexit, United Kingdom. Bookmark the permalink.